A theoretical modeling of the processes involved, in particular the role of conical intersections among the several electronic states involved. Pump-probe signal obtained after pumping the origin of NAPA B with nanosecond lasers and in the inset at a picosecond time scale. Time-resolved experiments performed in the nanosecond or picosecond (Collaboration with CLUPS, UPSud), are naturally conformer-selective thanks to their limited spectral width. However, this is no longer the case in the femtosecond (LUCA laser, SPAM / SLIC) where an additional conformer-selective process must be introduced. The « DIRCOS » project, for « Infra-Red Diagnostics for a COnformation-Selective femtochemistry », funded by the LabEx PALM (2013 Call), aims at developing a new probe technique based on the combination of nanosecond IR excitation and pump-probe femtochemistry. The theoretical approach of the excited state dynamics will be treated by quantum chemistry, which represents a real challenge for that discipline. It is conducted through a dual strategy combining nonadiabatic methods and more sophisticated quantum chemistry methods. 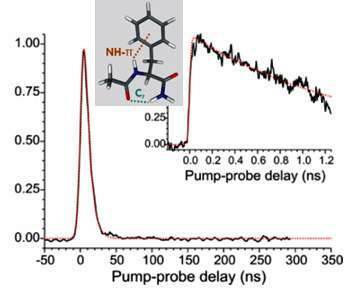 Our recent results about the excited state dynamics of Phenylalanine-containing peptides have been published in the Journal of the American Chemical Society.